So sorry that it's been a while. I am busy making lots of things for a Christmas craft fair I'm doing at the end of this month so have had very little time for pattern writing! 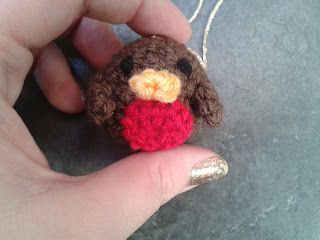 But here's a quick one for a little robin Christmas tree decoration. I decided to do this because although there are a few free patterns for robins out there, none use DK yarn and if worked in DK end up enormous and are not fit to hang on your Christmas tree. As DK is the most readily available yarn type here in the UK and it’s what I mainly have in my stash, I decided to write my own pattern! So here it is, available free for all! I hope you like it! As usual any questions, please feel free to ask and I'll be happy to help! The pattern can be downloaded for free here.